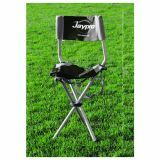 Foldable coaches stools with hook-and-loop carry strap. Weight capacity 275 lbs. 18" x 11" x 11". No back. 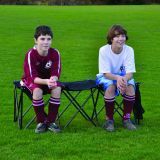 Convenient, collapsible benches fold in seconds, include carry bag and end gear pockets. Weight capacity per seat is 250 lbs. Seats 3. 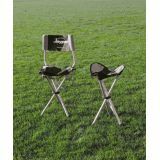 Deluxe Foldable Coaches Stool with seat back, supports up to 275 lbs. black/grey polyester, seat height 17.5", 30" x 15.5" x 13"
Foldable coaches stools with hook-and-loop carry strap. Weight capacity 275 lbs. 30" x 15.5" x 13". With back. 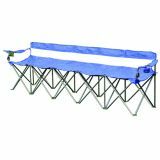 Five person bench with end cup holders folds compactly into a 6" x 21" x 32" carry bag. Each seat supports up to 250 lbs. 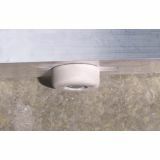 Optional floor protection kit ensures gym floors will not get scratched. Self-threading screws with 4 rubber feet.